We’re bombarded on an almost daily basis with reports on the impacts of climate change, both what we’re seeing today and what will happen in the coming decades. While it can leave all of us feeling like we’re in a dire, irreversible situation, those reports serve as a call to action. And as a resident of Massachusetts, you’re part of one of the most aggressive responses to climate change that has been implemented in the United States. Over the last two decades, Massachusetts has instituted nation-leading policies, taken first-mover actions, and facilitated a swell of clean energy development and climate-positive changes from residents and businesses alike. 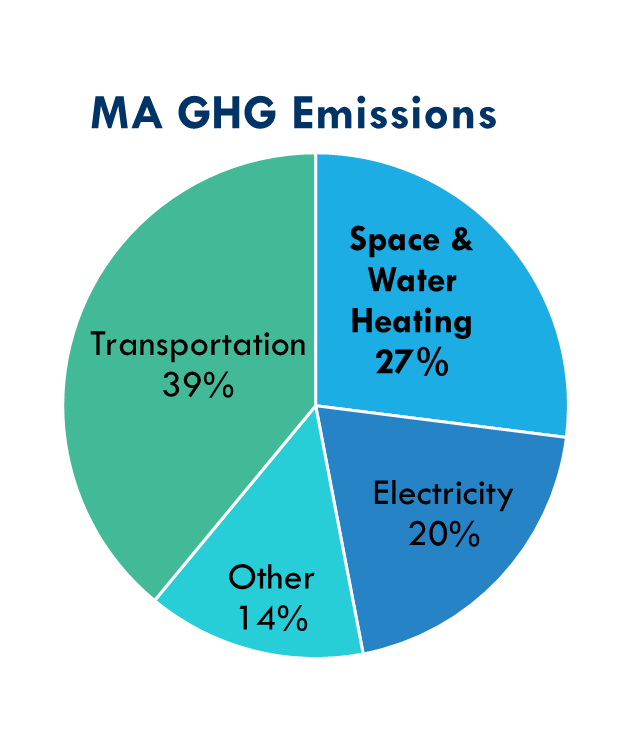 Here’s a look at greenhouse gas (GHG) emissions in Massachusetts and what we’re are doing about it, especially when it comes to emissions from heating our buildings. GHG emissions can be broken down into four high level categories with their corresponding contribution to the Commonwealth’s GHG emissions (see pie chart to the left). In Massachusetts, electricity represents one of the smaller emissions sectors. Electricity sector emissions come from power plants that burn fossil fuels. Over the last two decades, these emissions have been effectively reduced through cleaner powerplants, aggressive Renewable Portfolio Standard regulations, and support for clean electricity technologies like solar, wind, and hydropower. In fact, Massachusetts is required to have at least 35% of its electricity come from renewable sources by 2030. Transportation is the largest sector, including commuter vehicles and industrial vehicles such as freight delivery trucks. Anyone who commutes by car into Boston understands why this is such a large part of our emissions. As fuel economy increases and electric vehicles represent a larger share of our cars and trucks, emissions from this sector will be reduced. The space and water heating category represents our second largest source of emissions. Keeping buildings heated in New England takes an enormous amount of energy, and most of our buildings are heated with fossil fuels. When we look at our home’s gas or oil bills, it becomes clear how this can be such a large source of GHG emissions. But what is the “Other” category? This category represents everything else and includes non-energy related emissions such as methane and other chemicals that have a large GHG impact. When we look for ways to reduce GHG emissions from each of these categories, different solutions are needed. When we think about clean energy, we often think of technologies like solar photovoltaics, wind energy, or hydropower. While these energy sources are excellent solutions for cleaning up the electricity sector, we also need to implement the solutions to address the building and transportation sectors. 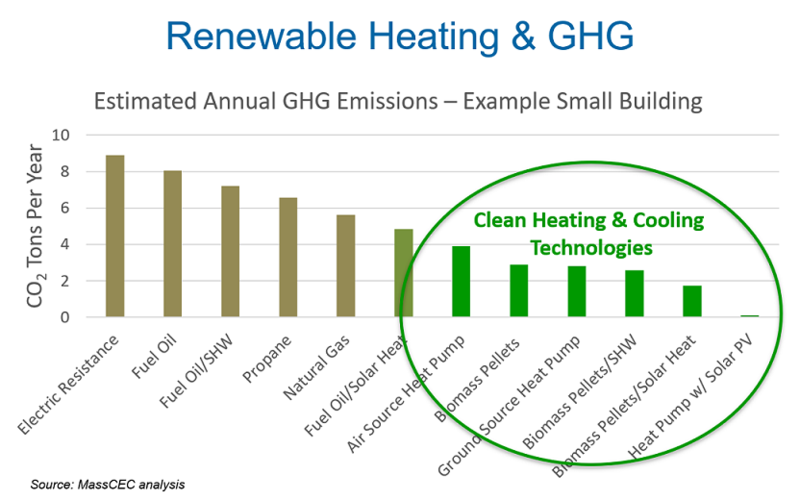 While all of these technologies deliver an immediate reduction in GHG emissions, the electric technologies have a significant added benefit: as the electric grid gets cleaner over the coming decades, so does the energy that powers heat pumps. Broad deployment of clean heating technologies coupled with a clean electricity mix will enable the Commonwealth to reduce emissions in the heating sector to a fraction of today’s level. The GHG benefits of clean heating technologies are clear: they are necessary for Massachusetts to be able to meet our ambitious 2050 GHG emissions reduction mandates. But how do their costs compare to traditional fossil fuel systems? The good news is that these technologies offer lower operating costs to the approximately half of the state that relies on heating fuel, propane, and traditional electric heat. There are also substantial rebates and loans to help reduce the upfront costs. On top of that, clean heating technologies offer an equivalent or higher level of comfort than a traditional fossil fuel system. In many ways, they’re simply a better way to heat. Governor Baker recently announced that clean heating technologies are a critical component of the state's Comprehensive Energy Plan. With the comfort, cost, and carbon reduction benefits, the time for clean heating technologies is now. MassCEC offers strong upfront rebates for clean heating technologies which can be used in addition to Mass Save’s rebate and financing programs.